A great way to begin your literature program is with the book The Giving Tree by Shel Silverstein. This book is simple in its words and drawings but displays perception, value, and the meaning of unconditional love. The author gives the attribute of loving and caring to the tree in the story. His opening sentence, "Once there was a tree and she loved the little boy" immediately denotes gender and emotion. The story goes on to tell of the unconditional love the tree shows to the boy. As you read this story to the children, stop and elaborate on the author's choice of words. Throughout the story, even as the boy grows in years, the tree still calls him "boy." Spend time on each page with the simple words and drawings. There are happy days and days of sadness, and yet each page shows a form of love. Which was happier, the boy or the tree? What is unconditional love? This may be difficult to explain to the children so use the simplest form you can. It is loving a person without limitations, no matter what they do. How did the boy treat the tree? How did the tree respond to the boy? How do families show unconditional love? What is forgiveness? How did the tree show it? Silverstein uses a variety of techniques to make his story enjoyable to read and allows you to be a vivid storyteller. His use of incomplete sentences shows that there is more on the next page. Children wait in anticipation. The staggered words symbolize the falling leaves, so as the storyteller, use your hands to show the falling leaves swaying as the words do on the page. The quotes on pages show speaking parts, so this is a cue to use different speaking voices. Silverstein also uses ellipses which means an incomplete thought. These tell that there is more to come in the story. As you read the story, invite the older children to think of what may come next. Let them give their thoughts. Create a crown of leaves from construction paper as the boy did in the story. Let the children pretend they are "kings in the forest." Make a time line for the story on a poster. Show the different ages of the boy. Design and place a paper tree on the wall. Allow the children to "carve" their initials in the bark with a crayon or marker. Find a tree stump in your playground or nearby park. Let the children visit the stump and count the rings on top. This will tell the age of the tree. Select a score of soft music that would make an appropriate background for the story. Re-read the story with the music. Reverse the story and call it "The Giving Children." 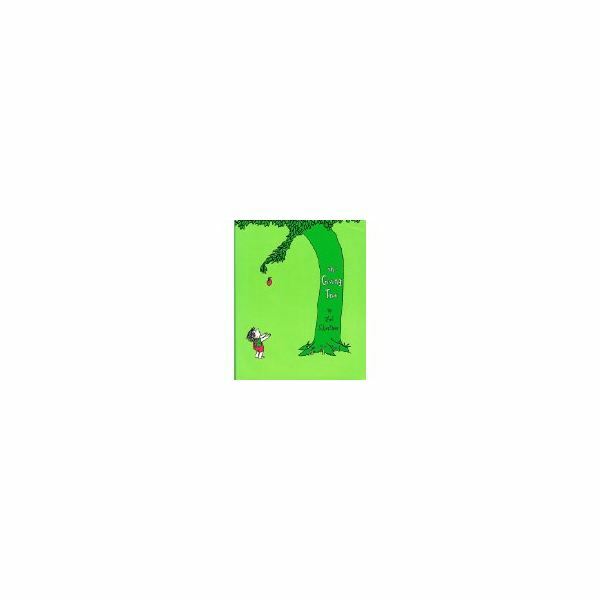 Invite the children to draw a picture showing something they would do for the tree. Ask each child to dictate his thoughts and the teacher can write this on the page. It's amazing what creative and caring thoughts the children will imagine. Place these on a bulletin board for parents and other teachers to read and enjoy. If possible, plant a small tree (sapling) in your yard to nurture and enjoy its growth. Use these ideas for teaching The Giving Tree to preschool students as the beginning of a literature program in your class. Continue with other books with additional lesson plans such as, A Color of His Own, The Carrot Seed and The Very Hungry Caterpillar.